Sabatino DiFranco first appears in the Painesville, Ohio, area in 1918. 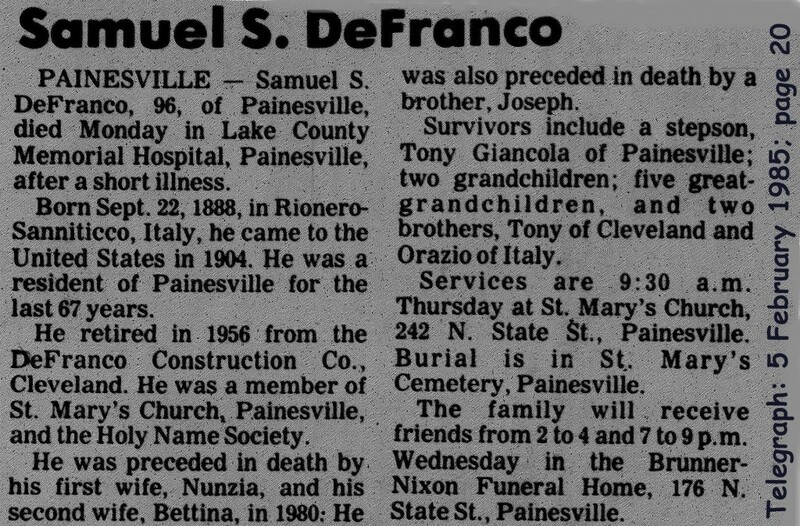 In America, Sabatino DiFranco was known as Samuel DeFranco. Sabatino DiFranco, son of Carmen DiFranco and Lucia DiVincenzo, was born on September 22, 1888, at Rionero Sannitico, Italy. He married first, Nunzia Tamburro, daughter of Paolo Tamburro and Angela Carnivale, about 1915. After the death (in 1952) of his wife, Sabatino married second, Bettina Izzi, daughter of Serafino Izzi and Florinda DeGeo, on August 28, 1954 at St. Anthony Catholic Church at Fairport Harbor, Lake County, Ohio. Bettina was the widow of Giulio Giancola. Sabatino died on February 4, 1985, at Lake County Memorial Hospital, Painesville, Lake County, Ohio, at age 96. His body was interred at St. Mary Cemetery at Painesville Township, Lake County, Ohio. Sabatino DiFranco immigrated to the United States at New York City, New York, on April 20, 1907, at age 18. He was traveling to Cleveland, Ohio, to join his brother Domenico DiFranco. He became a citizen of the United States on February 8, 1945. Sabatino resided at 217 Sanford Street, Painesville, Lake County, Ohio, when he was naturalized. Sabatino’s brother, Giuseppe DiFranco also lived in Painesville. 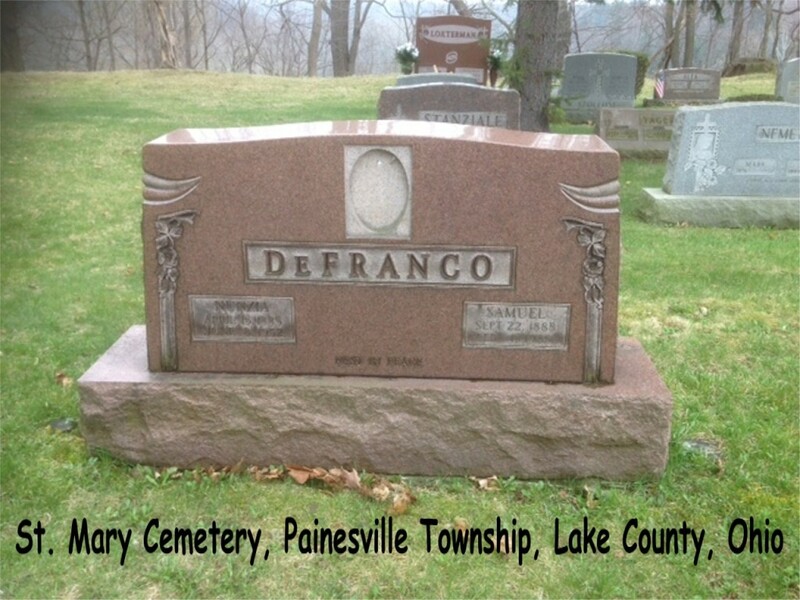 Mr. DiFranco was retired (in 1956) from the DeFranco Constuction Company of Cleveland. There were no known children of Sabatino DiFranco and Nunzia Tamburro.